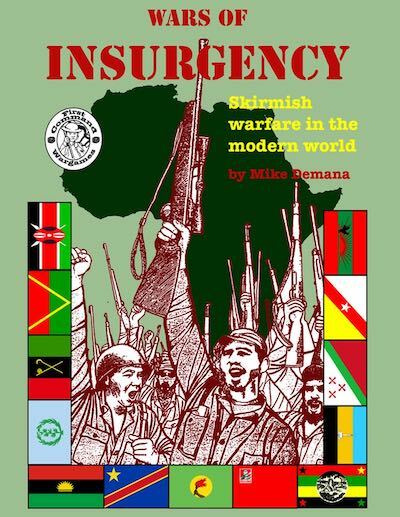 Wars of Insurgency is a simple, fast-play set of rules for modern warfare. It gives the flavor of "low intensity" or guerrilla warfare without getting bogged down in the complexity of trying to simulate every weapon. "Rise up and free your country from its oppressors!" Players control 3-5 squads of 3-12 miniatures -- with each figure representing one man. The rules include a complete campaign rules set allowing players to take on the role of factions fighting for control of their historical or fictional country. Political schemes, permanent institutions, and a system for eventual victory of one faction give more ways to spice up your miniatures games with a storyline. Three scenarios and guidelines for using historical events to create new ones are included. A complete point system allows Elite, Regular, and Militia troops to be matched up for fair games. The rules are meant to give the flavor of modern infantry firefights without being overwhelmed by complexity. First Command Wargames rules are meant to provide a fast, easy-to-learn game for the new or veteran player. 40pp, black and white interior.